Is Stephen Harper’s goal for Canada the United States of today? That would mean a nation in which somewhere between a half and a third of its citizens have fallen into poverty or are hovering just above, in low income. This according to latest data released by the U.S. Census Bureau. Meanwhile, 400 Americans are worth more than $1 billion. And the divide will likely worsen, as Congress and Republican-controlled state legislatures continue slashing programs and benefits, firing workers, and further weakening health, safety and environmental protections to make the rich richer and the poor poorer, if that is even possible. But rather than face the grim reality of a collapsing American society, conservatives question whether people classified as poor by the Census Bureau are really that poor. Are they actually suffering material hardship? asks Robert Rector, a senior research fellow at the Heritage Foundation based in Washington, D.C. Social safety-net programs have gone too far, Rector claims, citing poor people who live in decent-size homes, drive cars and own wide-screen TVs. Why should they get help from taxpayers? This analysis comes from an organization in which 72 executives and staff members each earned over $100,000 in 2009, with president Ed Feulner taking home $921,000 and executive vice-president Phillip Truluck $557,000. Rector is considered the “intellectual godfather of welfare reform” for his role in crafting the 1996 federal welfare legislation which ended “welfare as we know it” — signed by Bill Clinton — and created a permanent underclass of Americans available for low-paid, dirty work. While income for the rich was soaring, Rector ensured that income for the poor would be depressed even further. Having a large pool of low-income workers is exactly what Heritage Foundation folk want. It’s what makes the market work, they say. People are poor because they deserve to be poor. Otherwise they’d be rich like us. Here in Canada, the Fraser Institute and its radical conservative allies sing from the same songbook. We need vast disparities in wealth and income so the market can work better. Social programs that lessen inequality just get in the market’s way. Veldhuis himself must be counted as a successful Canadian — and why should he deprive the poor of their opportunity to become successful like him? But with a 2010 paycheque of $168,836, Veldhuis still has a ways to go before he’s really successful and safely ensconced within the one per cent. Veldhuis and his colleagues have fought mightily to forestall efforts to raise the living standards of the less well off, most notably the minimum wage, the living wage, and unionization. These are policies which, according the institute, impede economic freedom, the right of individuals to choose for themselves and to engage in voluntary transactions. Minimum wage laws and the right to be represented by a union infringe on the economic freedom of employers and employees, they say. Having a legislated minimum wage must inhibit a prospective employee’s freedom to choose an even lower wage. If a country has minimum wage laws and a high degree of unionization, it’s not going to do well on the Fraser Institute’s Index of Economic Freedom. Other indicators the institute says increase economic freedom are deregulation, unfettered free trade, low taxes, privatization, and minimal government spending — the usual suspects. As expected, Hong Kong, with the highest level of poverty in Asia and the most billionaires per capita in the world, leads the parade of the economically free. Canada ranks sixth, up from seventh in 2010. 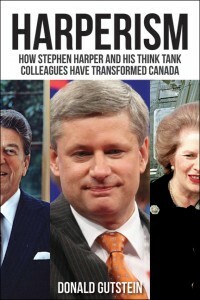 Harper has been a staunch advocate of neoliberalism and economic freedom since he was a graduate student at the University of Calgary in the 1980s. The importance of the economic freedom project to the Harper government was revealed when the Fraser Institute released its 2010 list. This occurred at a Fraser Institute lunch-hour policy briefing at Ottawa’s Rideau Club with guest speaker Peter Van Loan, Harper’s then minister of international trade, who was busy working on the Comprehensive Economic and Trade Agreement with the European Union. He did not mention that Canada’s income gap is widening faster than in the United States. And as Canada’s standing on the economic freedom index rises, so do the number of billionaires and the ranks of the poor and struggling.